This article explains the Heckscher Ohlin Model, developed by Eli Heckscher and Bertil Ohlin in a practical way. After reading it, you understand the core of this strategy theory. What is the Heckscher Ohlin Model? In the 1930’s, the Swedish economists Eli Heckscher and Bertil Ohlin developed a mathematical model for international trade. This Heckscher Ohlin Model is also called the H-O model or the 2x2x2 model. It is a general mathematical model that shows and explains that it’s best for countries to export production materials of which they have an excess. The Heckscher Ohlin Model makes it possible to find the trade balance between two countries. Each country has its own natural resources and specialities in the area of production. Think of the basic production materials, as we know them in nature, labour and capital; natural resources and auxiliary resources, labour forces and money to invest in industry, for instance. According to the model, countries should export production factors of which they possess an excess and import production factors of which they have a shortage. When this happens proportionally, it is where the foundation for international trade is found. At first, it was Bertil Ohlin who published his theory in his dissertation in 1933. He did this on his own, but he later added Eli Heckscher as co-developer of the Heckscher Ohlin Model. The Heckscher Ohlin Model emphasises the advantages of international trade and builds on the Comparative Advantage Theorem, created by British economist David Ricardo in the 19th century. According to Ricardo, international trade lines can be predicted based on the production factors present in a country. At the time, his model promoted free trade between countries; trade is advantageous for both parties. He also noted that, when one country is rich in iron, for example. and another is not, it can lead to good cooperation between the two countries. The Heckscher Ohlin Model expands on this with all the employment opportunities present in both countries. When a country has an excess of cheap production materials, it will export these production materials. It will also import the production materials that are scarce in the country. It is this exchange from one country to another that determines the comparative advantage. The profitability of production goods is determined by the input costs. A country that has an excess of capital as well as natural resources, but where labour is scarce, will have an advantage in trading with a country where the situation is reversed. In principle, the excess of capital and resources provides low prices, which makes it an attractive export product. When production is labour-intensive, it is wise to purchase this from other countries and to import it. According to the Heckscher Ohlin Model, the relative cost differences have to do with the previously mentioned production materials, but also the intensity of a specific economy. One country has more need for hired labour forces than another, for example, because their local production demands it. The H-O model assumes that the relative numbers of labour and capital make the difference between countries. The Heckscher Ohlin Model is also called the 2x2x2 model, implies that two countries are needed for trade, engaging one another in trade with two goods, and with two homogeneous production factors. The number of goods is equal to the production factors, which makes expansion within this model difficult. The model also assumes the ‘relations’ factor between countries is variable. Highly developed Western countries have a different and higher relation between capital and labour than third world countries, for instance. Because of this, highly developed countries are more often capable of trade. This leads to a comparative advantage, with which the highly developed country will have a business sector in technology and the developing country a labour-intensive business sector. The H-O model also assumes that the trading countries use the same production technologies. Even today, the Heckscher Ohlin Model still applies and it emphasises the advantage of international trade as well as world-wide advantages. 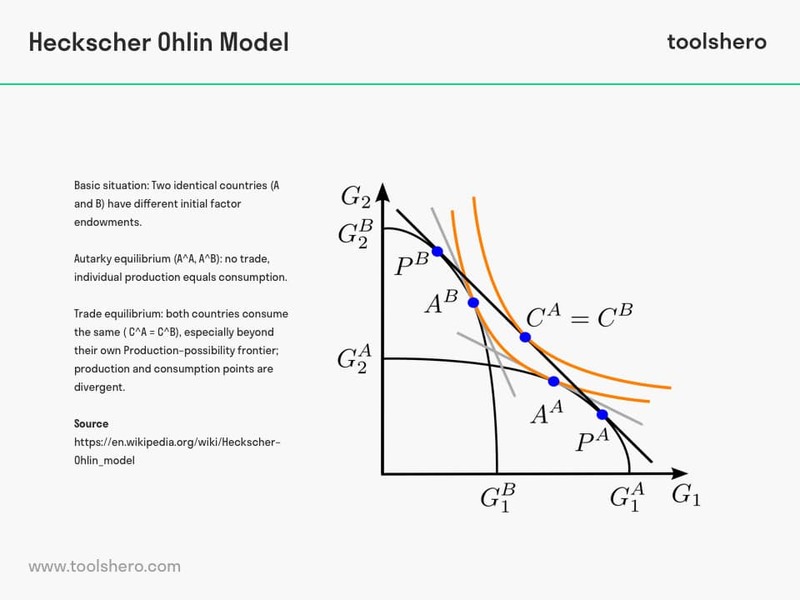 The Heckscher Ohlin Model is not limited to tradeable goods, but also focuses on abstract production factors like labour. When a country has an excess of natural gas, it can decide, aside from building a supply for local use, to export this to other countries. labour costs can differ from one country to the next, for which reason a country may decide to buy cheaper migrant workers for production and cleaning activities. In the sixties, both of these aspects developed in the Netherlands. On the one hand, natural gas was exported to Germany and other countries, while at the same time, cheap migrant workers were imported from Spain, Portugal, Turkey and Morocco. This way, the Netherlands no longer had to solely rely on the internal market, but could profit from the elastic world-wide demand. Could the use of the Heckscher Ohlin Model benefit your business? Do you recognize the practical explanation or do your have any additions? Do you have any tips or tricks that you want to share about international trade?